LOS ANGELES, Nov. 16 /CSRwire/ - The Opportunity Green Business Conference, the preeminent sustainability forum facilitating exchange of ideas and sustainable business solutions, brought together over 900 Fortune 500 business leaders and entrepreneurs from around the globe to showcase the most sought-after opportunities, profound innovations, technologies and trends accelerating the new green economy through an exchange of ideas on how to implement environment-friendly business practice, clean technology and innovation. 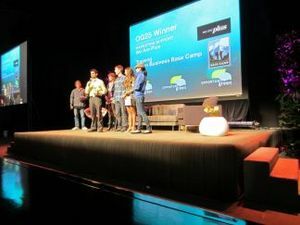 These 25 finalists - representing the best and brightest entrepreneurial initiatives in clean technology, transportation, infrastructure, social innovation, water management, food systems, community development and more competed in a fast pitch (one minute) presentation in hopes of being named "OG25 Green Start-Up of the Year". Several hundred companies were nominated for the prestigious award through Opportunity Green's website, recommendations by Opportunity Green staff and expert consultants. Nominations came from a variety of sectors, including water conservation, waste management, food systems, product design, social innovation, transportation and mobility, and resources conservation. To be nominated companies should be in business less than five years, have fewer than 50 employees and less than $5 million in revenue and were selected based on the combination of innovative thinking, potential for impact and execution of their idea. PrintEco received We Are Plus's $25,000 Brand and Marketing Package. We Are Plus is a marketing firm dedicated to strategic insights and creative solutions; their team of expert marketers is committed to building brands with purpose designed to meaningfully engage with audiences. This year was the most interactive and influential experience yet. * Opportunity Green is presented in partnership with The BMW Group and Gensler and hosted by UCLA Anderson School of Management Price Center for Entrepreneurial Studies with additional support from: Production Resource Group (PRG), Domtar Paper, Eastman Innovation Lab, Dell, eBay Green Team, AHA! Writers, Marsh & McClennan Companies, Yoxi, Los Angeles Center Studios, Southwest Airlines, Indo Teak Design, Kaiser Permanente, UCLA Institute of the Environment and Sustainability, UCLA Extension, American Apparel, Cedars-Sinai, Los Angeles World Airports, Southern California Gas Company, Metropolitan Water District of Southern California, Everpure Pentair Water, Energy Upgrade California, Bottlehood, Vapur, American Reclaimed Product Supply, Borrego Solar, Boxman Studios, Zimride, ChicoBag, Daqri, QuickMobile, Boostability, NS Tech, Hotel Angeleno, Design Printing LA,Tern Bicycles, Native Energy, Yolo Colorhouse, Bikes Belong, ICON Aircraft,Tender Greens, Border Grill, Calamigos Ranch, Large Marge Sustainables, Weaver's Coffee & Tea, Kevita, Sustainable Produce Urban Delivery (SPUD), repurpose, Honest Beverages, ecoProducts, PopChips, Kashi and KIND. For a full list of the OG Competition Finalists, please see below. Founded in 2007, Opportunity Green brings together leading companies and visionaries in technology, design, media and more, showcasing the hottest opportunities to drive profitability through sustainability. The conference exposes and connects participants to an interdisciplinary cross-section of ideas at the forefront of sustainable business practices through a variety of formats, including creative panels and experiential workshops. Opportunity Green is the largest multidisciplinary green business conference, attracting over 850 attendees from Fortune 500 powerhouses to cutting-edge startups. Opportunity Green is the proud recipient of the Golden Arrow Award for Overall Excellence in Product Stewardship from the California Product Stewardship Council and a finalist for "Best Green Initiative" in the BizBash West Event Style Awards. For more information: www.opportunitygreen.com. From insulation to absorption, sound barriers to packaging, Aeroclay is an advanced materials company dedicated to creating the perfect innovative, high-performance, and eco-friendly materials to meets your business's needs. Alphabet Energy allows for customers to convert their waste heat to electrical power in the range of microwatts to megawatts. Their revolutionary, all-silicon thermoelectric approach is the only of its kind that lends itself to massive scale, low cost, and high sustainability. Bottlehood reclaims, repurposse and reuses glass bottles, barrels and other products from local restaurants, bars and events to create tumblers, glasses, vases and lighting and more. BrightFarms designs, finances, builds, and operates hydroponic greenhouse farms at supermarkets eliminating time, distance, and cost from the food supply chain. Cardborigami, a portable, waterproof, and flame-retardant shelter, is an innovative approach to alleviating homelessness. Providing protection from the elements, Cardborigami supplies instant shelter for those who have nothing. Committed to changing the repair industry, Dozuki creates wiki-style repair manuals for brands, available to be downloaded as an applicaiton or PDF, or easily accessible online. Eco Aluminum pallets is a viable alternative to plastic and wooden pallets, allowing the worldwide transportation of goods with lower fuel consumption and lower green house gas emissions. With the goal of providing power throughout the entirety of the developing world, EGG Energy provides electronic power in the form of portable, rechargeable, and affordable batteries to low income African houses. Grid Test Systems provides unique portable test equipment to confirm the safety and operational status of Electric Vehicle Charging Systems, helping to build a future where you can plug your vehicle into any public or private EV Charging station to fuel up. Honest Buildings is part of the next great shift change in the movement to create and develop high performance buildings. Through a collaboration-based platform, it offers mechanisms for owners, managers, and occupants of buildings to showcase their latest innovations. Kiverdi develops alternative fuels and bio-products to reduce the reliance on carbon dioxide emissions without posing a threat to natural habitats or impacting the economics of food production. Revolutionizing the economics of green energy, Langson Energy has created the Gas Letdown Generation, an efficient and unique power conversion system, which turns gas pressure into power. Makani Power creates airborne wind turbines to extract energy from powerful winds at high altitudes. These turbines produce energy at an unsubsidized real cost that is competitive with coal-fired power plants. A leading program for "greening" your everyday lifestyle, Practically Green applies sustainability and eco-consciousness to businesses and people, incorporating environmental awareness and actions into our world, one person at a time. The Mutual is a platform that connects businesses, non-profits & individuals in a design that makes it easy & advantageous for each to support the environment in a relevant way. Donate to charities & get rewarded with Perks from great brands. The Nest is a learning thermometer, which programs itself within a week to keep you comfortable while saving energy, creating the perfect balance between conservation and comfort. QuaDror is a new space truss geometry that unfolds manifold design initiatives and can adapt to various conditions and configurations. It creates a new framing system for all kinds of buildings, striving for a better world through creativity. The water recycling shower incorporates a recirculation system that automatically cleans, filters, and pasteurizes your shower water in less than 30 seconds. RepRisk monitors companies and their environmental, social, and corporate governmental risk exposure. On a daily basis, they screen thousands of sources including all major print media, over 700 NGOs, blogs, and newsletters. Seglet connects property owners with commercial and individual users interested in renting or profit-sharing rooftops to generate new forms of solar energy, urban agriculture, wind energy, and more. SolaDyne Capital is a hybrid engineering–finance firm that develops and implements units in a renewable energy efficient system for institutional, corporate, and government clients. Promoting clean, renewable energy, Solar Mosaic brings people together to build community solar projects on building that have the ideal roofs and space. Spinlister is a bike rental marketplace that allows you to find a great bike to rent or list your bike to earn cash, connecting individuals who wish to travel and explore in an environmentally friendly way. Transonic Combustion is a revolutionary combustion system enabled by injecting supercritical fuel directly into the combustion chamber, achieving significant fuel efficiency improvements for globally sustainable transportation.